U.S. Congressman Carlos Curbelo (FL-26, R) and May Boeve, executive director of 350.org, a leading campaign in the fight to address climate change, are this year’s recipients of the John F. Kennedy New Frontier Awards. 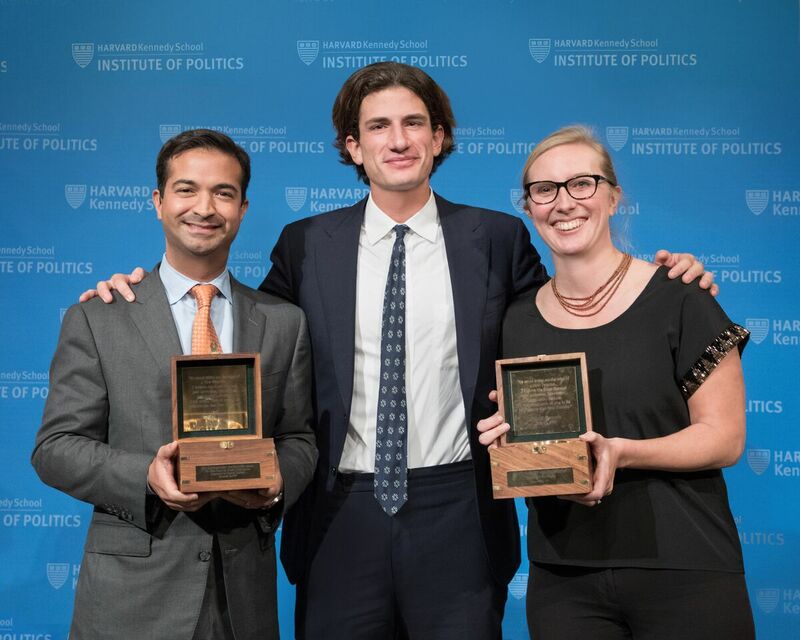 The awards were presented by Jack Schlossberg, President Kennedy’s grandson, during a ceremony on November 16, 2017 at the Institute of Politics, Harvard Kennedy School. Created by the John F. Kennedy Library Foundation and the Institute of Politics, Harvard Kennedy School, the New Frontier Awards honor Americans under the age of 40 who are changing their communities and the country with their commitment to public service. The awards are presented annually to two exceptional individuals whose contributions in elective office, community service, or advocacy demonstrate the impact and the value of public service in the spirit of John F. Kennedy. Boeve and her team at 350.org were part of the coalition that organized the historic 2014 People’s Climate March, which drew more than 300,000 people to New York City to advocate global action on climate change. The march was the largest of its kind, and brought together more than 1,100 disparate groups that previously had not prioritized climate change as a policy issue, including labor unions, religious institutions, health organizations, community activists, and universities. At the New Frontier Awards ceremony, Jack Schlossberg will present Boeve and Curbelo each with a ship’s navigational compass in a wooden box bearing the inscription: “We stand today on the edge of a New Frontier….I believe the times demand new invention, innovation, imagination, decision. I am asking each of you to be pioneers on that New Frontier.” – John F. Kennedy. Past recipients of the New Frontier Awards include Pete Buttigieg, the Mayor of South Bend, Indiana, Kirsten Lodal, Co-Founder and CEO of LIFT; Svante Myrick, Mayor of Ithaca, New York, Nina Dudnik, Founder and CEO, Seeding Labs; Charles Best, founder and CEO of DonorsChoose.org; Stacey Abrams, House Minority Leader for the Georgia General Assembly and State Representative for the 89th House District; Cory A. Booker, U.S. Senator and former Mayor of Newark, New Jersey; U.S. Representative Tulsi Gabbard of Hawaii; Eric Garcetti, Mayor of Los Angeles; Wendy Kopp, Founder and CEO of Teach for America; and Zainab Salbi, Founder and CEO of Women for Women International. A distinguished bipartisan committee of political and community leaders selected Boeve and Curbelo based on their contributions to the public and their embodiment of the forward-looking public idealism to which President Kennedy hoped young Americans would aspire. The 2016 John F. Kennedy New Frontier Awards Committee was co-chaired by Steven Rothstein, Executive Director, John F. Kennedy Library Foundation, and William Delahunt, Acting Director, Institute of Politics, Harvard Kennedy School. Committee members are: Terence Burke, Vice President of Communications Strategy, Greater Boston Chamber of Commerce; Carolyn Casey, Founder and Executive Director, Project 351; Ranny Cooper, Senior Consultant, Weber Shandwick Public Affairs, and former Chief of Staff for Senator Edward M. Kennedy; The Honorable William “Mo” Cowan, Vice President, General Electric Legal Policy and Litigation and former United States Senator (D-MA); Dan Fenn, former member of President John F. Kennedy’s staff and former Director of the John F. Kennedy Library; Tina Flournoy, Chief of Staff, Office of President Clinton, The Clinton Foundation; The Honorable Rachel Kaprielian, U.S. Government Relations at McDonald’s Corporation, former MA Secretary of Labor & Workforce Development, former MA state legislator, and past Fenn Award recipient; Steven Olikara, Founder and President, Millennial Action Project; Vivien Li, President and CEO, Riverlife, and former President, The Boston Harbor Association; Kristin McSwain, Executive Director, Boston Opportunity Agenda and former Director, AmeriCorps; The Honorable Doug Palmer, Former Mayor, Trenton, New Jersey; Aneesh Raman, Global Policy at Facebook, and former domestic policy speechwriter, President Barack Obama; Kristen Soltis Anderson, GOP strategist, columnist, The Daily Beast; Jack Schlossberg, grandson of President John F. Kennedy; T.W. Shannon, President of Bank2, and Former Speaker of the Oklahoma House of Representatives. The John F. Kennedy Library Foundation and Harvard Kennedy School’s Institute of Politics both have their origins in the John Fitzgerald Kennedy Library, Inc., a non-profit corporation that was chartered in Massachusetts on December 5, 1963, to construct and equip the John Fitzgerald Kennedy Presidential Library and Museum in Massachusetts.